Indeed, there is joy when brothers dwell in unity. This statement is not a façade but an expression of the fact at the inter-seminary interaction held in our seminary from the 27th – 29th February, 2019. 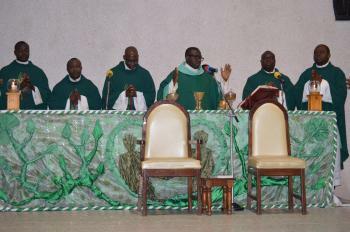 This interaction afforded the seminarians from the seminaries within the Benin, Ibadan and Lagos Ecclesiastical Provinces: St. Albert the Great, Idowu-Offoron Abeokuta, All Saints, Uhiele Ekpoma and Saints Peter and Paul, Bodija Ibadan, the opportunity to fraternize, learn, play and relax together as brothers in unity. The event began with a Solemn Sung Vespers in which the chapel was filled with such ardour and aura of joy visible in the unity of voices in the beautiful chants of the Psalms. Immediately after supper, there was a symposium on “The Proper Human Formation for Authentic Priestly Values”. Three papers were presented on sub-themes on the human dimension of priestly formation, one from each seminary. The first paper dealt with the prevalence of sexual scandals in the Church in recent times; the second paper drew a connection between social media and technology with the human formation of the contemporary seminarian; and the third paper identified the centrality of the human dimension in priestly formation. On the following day, February 28, in a friendly competitive manner, each seminary showed its vitality in different games, which include: Basketball, Volleyball, Lawn Tennis, Table Tennis and Football. In the evening, the auditorium was filled to capacity for a social night. Again, each seminary took turn for musical and dramatic presentations. 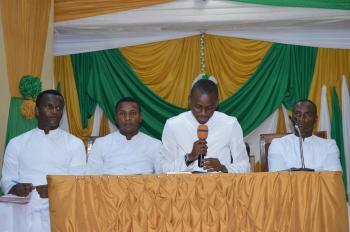 The essence of the interaction was reiterated in the remarks of the Acting Rector, Fr. Anthony Ewherido, who enjoined brothers to develop good and valuable friendship across dioceses and seminaries, for this, he said, could be a source of relief and strength in the nearest future.